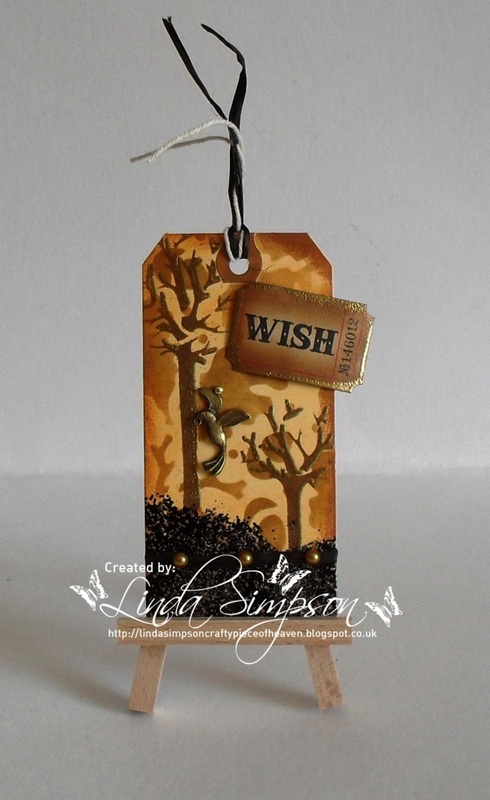 Today we would like to share with you a creation made by the lovely Jennifer Johnston. 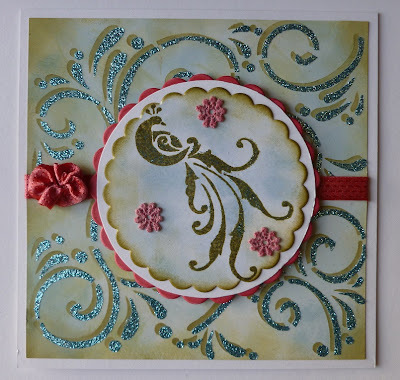 We hope that you will gain some inspiration from this beautiful card. Base card has been coloured with Distress Inks then laid the flourish stencil down and dabbed some forest green ink though the stencil. Once this was dry I laid the stencil down but moving slightly to one side of the forest green image and spread Sparkle Medium over the stencil. This was then matted onto the base card after I added ribbon around the centre once I had coloured with Pink Promarker Pen. 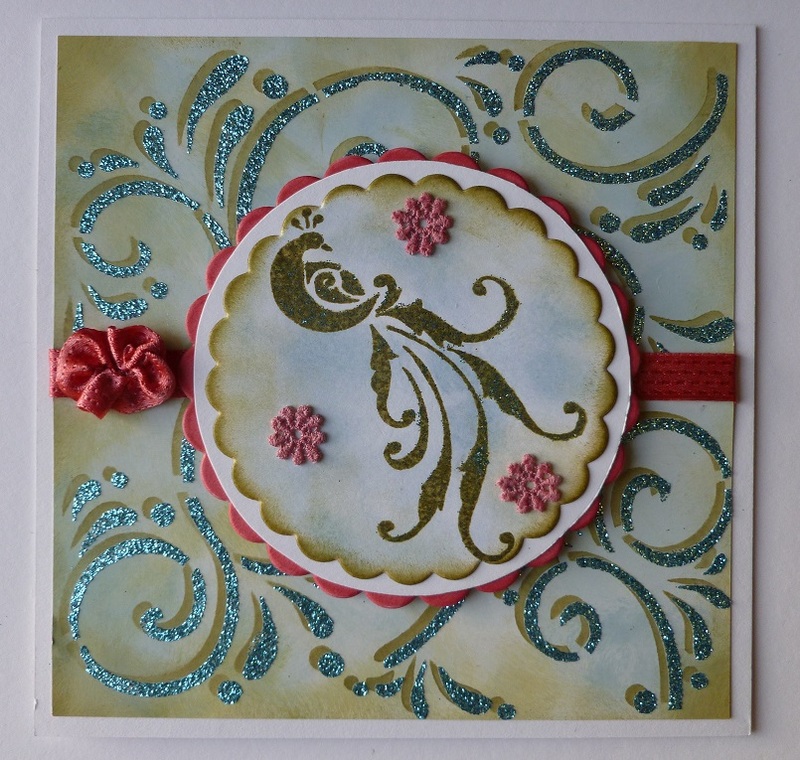 I cut out a scalloped circle from white card and coloured it to match the ribbon. The flower was made from the same ribbon by using a running stich and gathering it up to make the flower shape. The Bird of Paradise was stamped onto a scalloped circle of white card which I coloured to match the main card then overstampsed slightly to one side of the forest green image, using Sparkle Medium. I then matted this onto a slightly larger white circle which was then matted onto the pink scalloped circle. I then coloured 3 lace flowers using the pink Promarker pen and glued them in position using Magi-Bond Glue. Thank you for visiting and please do leave a comment. I hope you are all having a wonderful day and that the sun is shining wherever you are. Today I would like to show you a tag I made using Imagination Crafts Acorn and Three Trees Stencils with Distress inks Wild Honey and Vintage Photo. I have used Fran-tage black embossing enamel. I made top 3 in a challenge with my tag. What do you think of the new blog design? Isn't it fabulous! I spoke to Sue today and she is going to be doing some crafting this weekend! Looking forward to seeing what she makes! We would like to thank Kath (mucky paws) for all her hard work in putting this together for us. 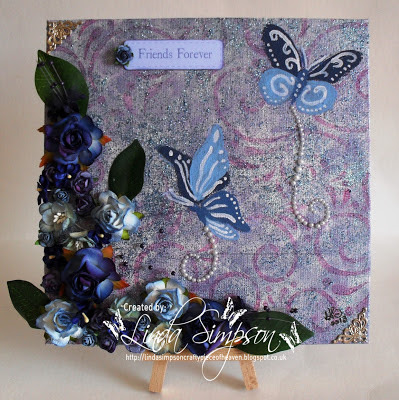 Today I am showcasing a canvas that I made using Sparkle Medium and the Flourish Mask. I love to use my different mediums and masks for all sorts of crafting projects. 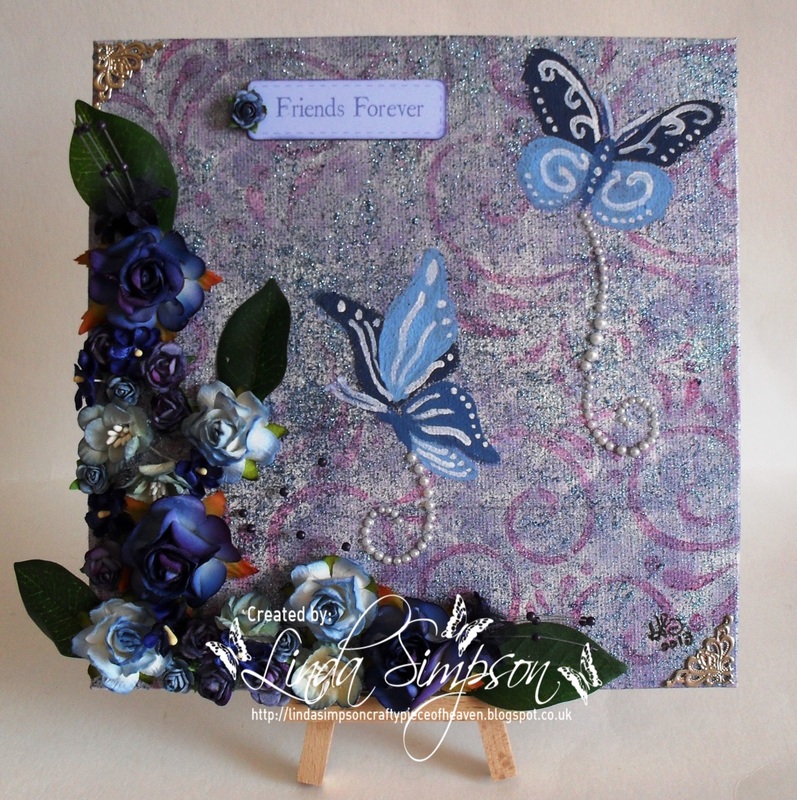 Now don't get me wrong, I love to make cards too with these beautiful masks as you can create the most wonderful backgrounds and toppers for any occasion. I hope you like what I have created. To create the background I stippled Sparkle Medium in Blue Sapphire so that you can see the white of the canvas to give some dimension.